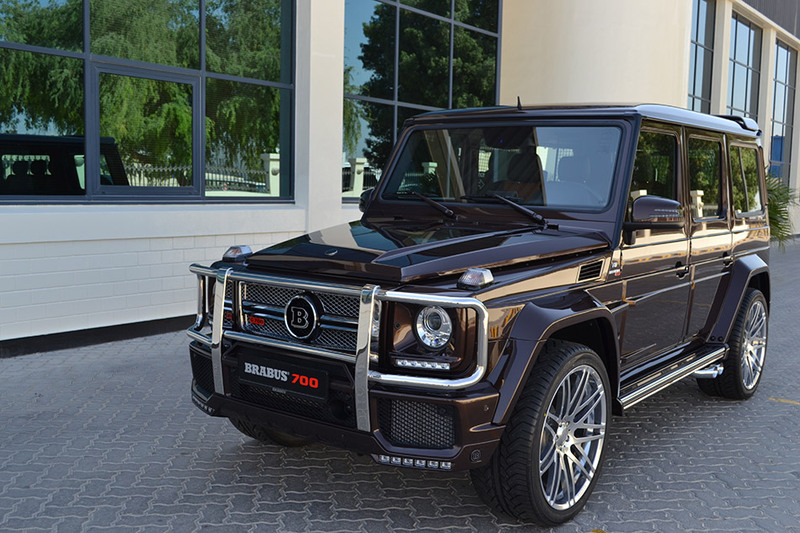 BRABUS B63S - 700 WIDESTAR – that is the new exclusive power off-roader based on the Mercedes G 63 AMG, which celebrates its world debut at the 2013 DUBAI INTERNATIONAL MOTOR SHOW. It is powered by a 5.5-liter Biturbo V8 engine producing 515 kW / 700 hp (690 bhp) that accelerates the all-wheel-drive vehicle from rest to 100 km/h (62 mph) in just 4.9 seconds. Top speed is electronically limited to 240 km/h (149 mph). Visually the power off-roader captivates with its thrilling WIDESTAR widebody version and 23-inch BRABUS "Platinum Edition" Monoblock E, F or R forged wheels. The BRABUS Dynamic Ride Control suspension offers a perfect symbiosis of outstanding ride comfort and dynamic handling. Exclusive interior options round out the product line-up for the latest evolution of the Mercedes G-Class. BRABUS offers the world's most extensive engine tuning program for Mercedes-Benz automobiles, backed by the one-of-a-kind BRABUS Tuning Warranty® of three years, up to 100,000 kilometers/62,000 miles (see BRABUS Warranty Terms and Conditions, updated July 2013). For the new Mercedes G 63 AMG the BRABUS motor engineers adapted the B63S - 700 performance kit, which is already available in custom versions for the latest AMG GL 63 and ML 63 models with eight-cylinder Biturbo engine. At the heart of the BRABUS B63S - 700 engine conversion are the newly designed peripherals of the turbocharged eight-cylinder four-valve engine. 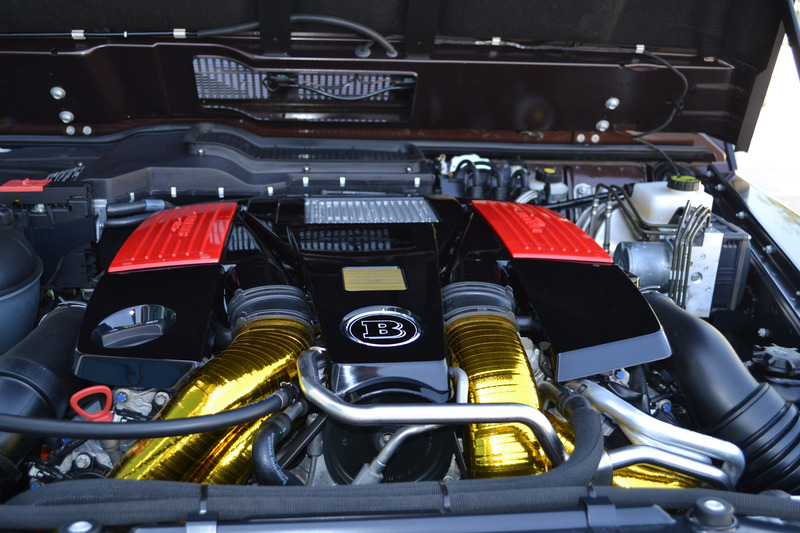 While the intake and charge-air pipes immediately catch the observer's eye thanks to their BRABUS Gold Heat Reflection sheathing, the other important details of the conversion remain invisible from the outside. They include the two special BRABUS turbochargers with larger compressor unit, which generate a higher boost pressure than the production turbos. The production exhaust system is replaced by a free-flow metal catalyst system that features downpipes with a diameter of 75 mm (2.9 in.). 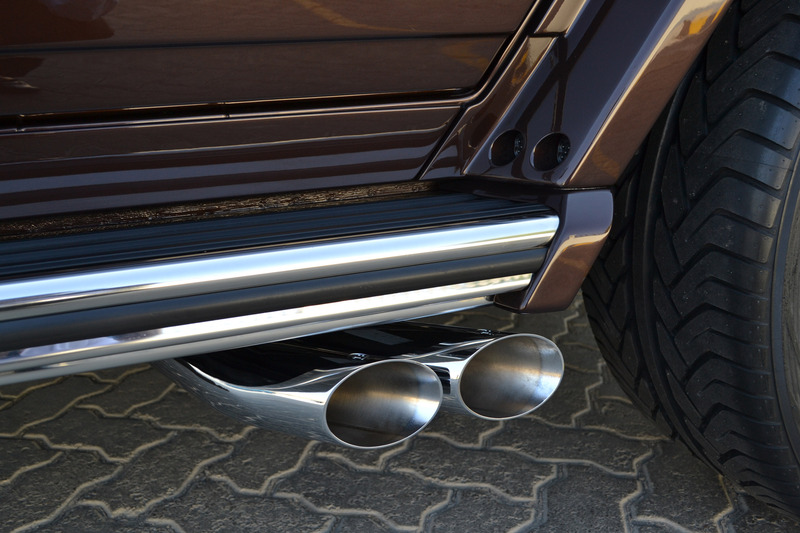 The ideal complement to the engine tuning of the G 63 AMG is a BRABUS stainless-steel sport exhaust system with controlled butterfly valve. At the push of a button on the steering wheel drivers can choose between a quiet "Coming Home" mode and enjoying an earthy, full-blooded V8 sound when the "Sport" position is selected. With two tailpipes exiting in front of the rear wheels on either side, available with a standard or black chrome finish, the stainless-steel exhaust system also adds some visually thrilling highlights. Using state-of-the-art test rigs and test drives on public roads and in terrain the BRABUS electronics specialists and engineers orchestrated the perfect coordination of all high-tech components with new mapping for injection and ignition. The result is a perfect symbiosis of environmentally compatible exhaust emissions in line with current EURO V standards, durability beyond reproach and outstanding power yield. 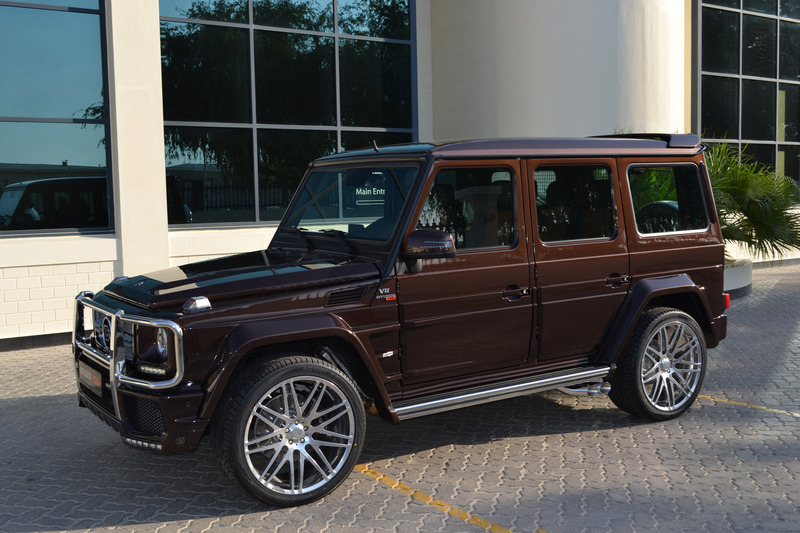 With a power output of 515 kW / 700 hp (690 bhp) at 5,300 rpm the BRABUS B63S - 700 engine in the G 63 surpasses its original by 115 kW / 156 hp (154 bhp). Just as impressive is the increase in peak torque to 960 Nm (708 lb-ft). Peak torque is capped electronically to protect the powertrain. The high-tech lubricants for the entire powertrain are supplied by technology partner MOTUL. The combination of ultra-powerful BRABUS B63S - 700 engine and AMG SPEEDSHIFT PLUS 7G-TRONIC transmission delivers performance levels that previously seemed more likely for a sports car than for an SUV. 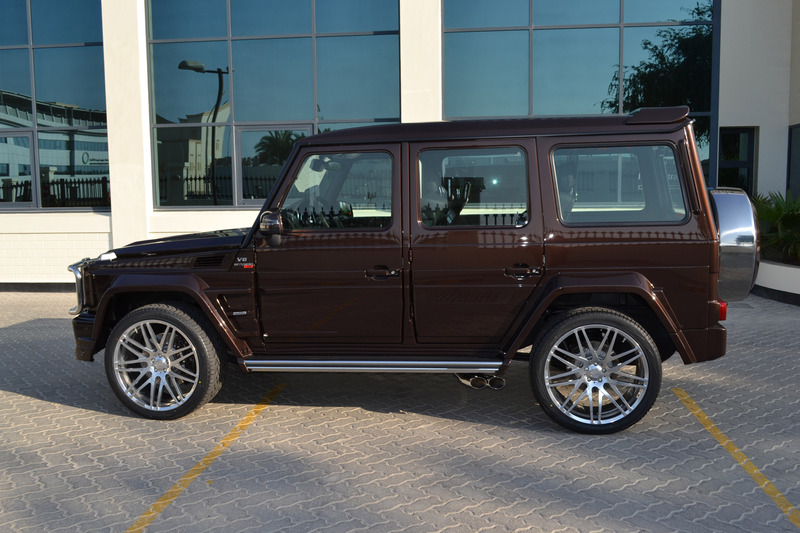 From rest the all-wheel-drive car based on the G 63 accelerates to 100 km/h (62 mph) in just 4.9 seconds. The BRABUS Vmax unit, which is part of the engine conversion, limits the top speed electronically to 240 km/h (149 mph) to protect the tires. For manual gearshifts via shift paddles like in Formula 1 racing BRABUS upgrades the multifunction steering wheel of the G-Class with special ergonomically shaped aluminum shift paddles. Visually the BRABUS B63S - 700 WIDESTAR also stands out from the crowd: the BRABUS designers developed a striking WIDESTAR widebody version specifically for the latest facelift generation of the G-Class. The powerfully sculpted fender flares add twelve centimeters (4.8 in.) to the width of the G-Class body. Thanks to integrated air outlets they also optimize venting of the wheel houses. The strikingly styled fender attachments that continue on the front doors lend the SUV great recognition value even when seen from the side. LEDs integrated into the front and rear WIDESTAR fenders illuminate stainless-steel running boards when a door handle is pulled or the keyless remote is used. In addition, the braces in the fender attachments are also illuminated. Of course the fender flares create space for extremely large tires and wheels as well. BRABUS offers owners of the widebody version, which is also available for all other current five-door G-Class models, a wide range of tailor-made tire/wheel combinations with diameters from 20 to 23 inches. The most exclusive option features BRABUS 23-inch forged wheels that represent an ideal combination of lightweight design and maximum strength. In size 11Jx23 the two popular designs Monoblock E evo "Platinum Edition" and Monoblock F "Platinum Edition" are now joined by the BRABUS Monoblock R wheel. It provides evidence of its high-tech design with an integrated "Platinum Edition" badge as well as with its nine double-spokes arranged in two matt titanium and fully polished planes. The size 305/35 R 23 high-performance tires are supplied by BRABUS technology partners Continental, Pirelli and YOKOHAMA. The BRABUS front spoiler attaches to the production fascia, and characterizes the front of the off-roader not least with its integrated LED lights. The two BRABUS signets integrated into either side light up when a door handle is pulled. An additional faceplate below the radiator grille adds further to the enhanced passing clout of the widened G-Class. There is a special insert with integrated BRABUS logo for the front grille as well. To give the front an even more unmistakable design, BRABUS also offers dark-tinted BRABUS xenon headlights with integrated dark-tinted LED daytime running lights. The latter also serve as turn signals and thus render the production turn signals on top of the fenders obsolete. They are replaced by tailor-made clear-coated carbon-fiber covers. 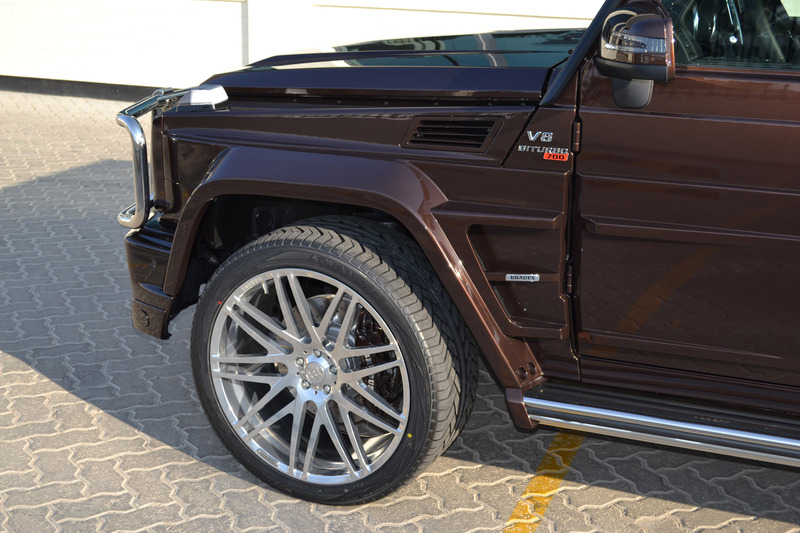 Of course the BRABUS components for the front are available for all G 63 AMG models without WIDESTAR conversion as well. 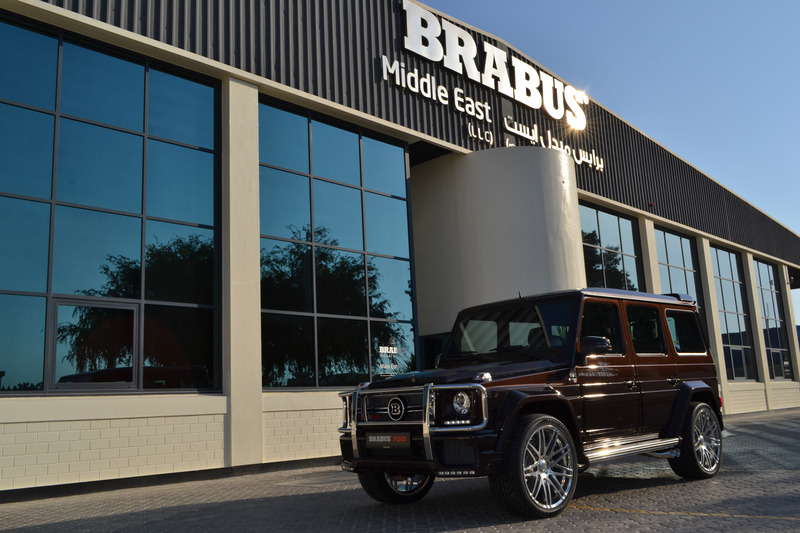 The powerful design idiom of the BRABUS WIDESTAR version with stylized underride guard continues in the rear fascia. In addition to a central reflector, the WIDESTAR rear bumper features a rear fog lamp and a backup light on either side. The station wagon of the G-Class can be upgraded further with a BRABUS roof spoiler. For a perfect symbiosis of outstanding ride comfort and safe, sporty handling the BRABUS B63S - 700 WIDESTAR comes with the innovative BRABUS Ride Control suspension, which is available for all G-Class models. This BRABUS high-tech suspension system was developed in cooperation with technology partner BILSTEIN and features two-way electrically adjustable shock absorbers. An aluminum button with blue illumination sporting the BRABUS logo on the center console lets the driver manually choose between two setups: in comfort mode the off-roader provides exemplary ride comfort. At higher speeds and for a spirited driving style the firmer sports setting offers more dynamic handling and even further increased safety reserves. Furthermore, the BRABUS Ride Control suspension features automatic damper adjustment. If the vehicle sensors detect that certain parameters such as speed, lateral acceleration and steering angle might lead to a critical handling situation, the system autonomously switches to the firmer sports setting in the blink of an eye. The sportier damper setup further improves the handling stability of the all-wheel-drive vehicle. In return the CAN control unit also detects when the driver reverts to a more moderate driving style. In that event the system automatically switches back to the comfort position. It goes without saying that the cockpit can also be customized in personal and exclusive fashion. The passengers are welcomed by stainless-steel scuff plates with backlit BRABUS logo. Further attractive accessories include high-quality velour floor mats and BRABUS aluminum pedals and door-lock pins. The BRABUS interior is customized to the owners' individual specifications and offers a multitude of colors for the especially soft and breathable BRABUS Mastik leather and Alcantara. Just as boundless is the selection of upholstery designs and the variety of exclusive wood inlays, which are available in any desired color. Also available is wood trim with an especially exclusive yachting design.